Justin Verlander is extremely competitive, and he bested every pitcher in baseball today with his new contract extension. His five-year, $140MM extension with the Tigers has a $28MM average annual value and will keep him in Detroit through the 2019 season. The deal also includes a vesting option for 2020 worth $22MM. Verlander's AAV is the highest ever for a pitcher, unless you count Roger Clemens' pro-rated 2007 salary. Verlander's new contract could be called a seven-year, $180MM deal, since this contract technically replaced the two years and $40MM Verlander was owed for 2013-14 without an increase. In that sense, it tops Felix Hernandez's seven-year, $175MM contract from last month (Felix received $135.5MM in new money, so Verlander wins that comparison as well). The option for 2020 will vest if the hurler finishes top five in the 2019 Cy Young voting and includes a no-trade clause, though he was three seasons away from obtaining ten-and-five rights anyway. Predictably, the deal also includes performance bonuses for winning MVP and Cy Young awards. 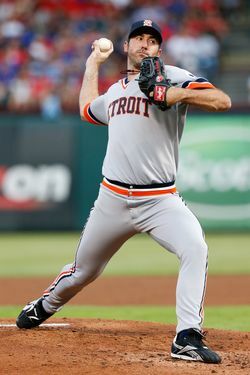 Verlander said recently that he would not engage in contract talks once the season got underway. With little talk of progress between the two sides in recent weeks, it didn't seem likely that a deal would be worked out in time. With Verlander's new pact and deals for Prince Fielder, Anibal Sanchez, and Miguel Cabrera, the Tigers now have north of $90MM committed to four players for 2015. Verlander's last extension was also of the five-year variety and was worth $80MM across the 2010-2014 seasons. The Tigers haven't done much in the way of extensions since then, as MLBTR's Extension Tracker shows. Ryan Raburn's two-year deal prior to the 2011 season was Dombrowski's last. Even though Verlander bested Hernandez's deal by $5MM, he may not stay atop the mountain for long. His deal likely boosts the value of a deal for Dodgers left-hander Clayton Kershaw, who is also scheduled for free agency following the 2014 season. Here are MLBTR, we don't consider Verlander's contract anywhere close to $200MM — we prefer to look only at new, guaranteed money. In that sense, C.C. Sabathia's seven-year, $161MM contract signed in December 2008 is still the largest ever given to a pitcher. Buster Olney of ESPN.com (on Twitter) reported the terms of the deal. Jon Paul Morosi of FOX Sports (on Twitter) had other details of the contract. Photo courtesy of USA Today Sports Images. Tim Dierkes contributed to this post.